Thanksgiving is coming up in a couple weeks so you know what that means... Christmas shows! 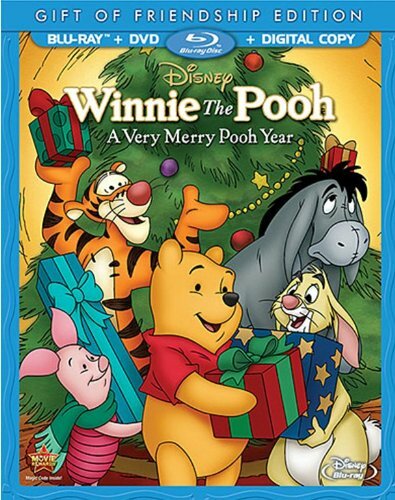 I was sent a couple of blu-rays to review, Winnie the Pooh: A Very Merry Pooh Year and Mickey's Christmas Carol. I've seen Mickey's Christmas Carol many times so I figured I'd start with Winnie the Pooh. I have to admit that I'm not really a Winnie the Pooh fan. I never found the shows to be all that interesting or engaging, and this special didn't convert me into a Pooh-er, or whatever you call Pooh fans. This special is about an hour long and contains two basic stories, one about the spirit of Christmas and one about New Year's resolutions. For the Christmas part, Pooh and the gang make up a list for Santa Claus consisting of some extravagant wishes, and send it to the North Pole by throwing it into the wind, but it flies right to Pooh's house. So he builds some makeshift presents for his friends, then dresses up like Santa Claus and delivers them. Now, while the presents may look like the gifts they asked for, they all break pretty much instantly. So the group seeks out Santa to prevent him from delivering any more presents. Of course, they find Pooh and Pooh offers to just take the list to the North Pole himself. Once he's gone, the group realizes the true spirit of Christmas, that it's about being with friends and family, not about presents. In the New Year's resolutions part, Rabbit is trying to take care of his only carrot when the group takes over his house, has a party, and almost destroys his carrot several times. So he gets mad and decides to take off, causing the group to think it's their fault and that they need to change. And while it is their fault, they really just need to be more respectful, but they don't get that. Instead, they each pledge not to do the thing they like doing best. Pooh vows never to eat honey, Tigger promises not to bounce, Piglet swears not to be afraid, and Eeyore agrees not to be such a downer. There are a couple of songs in this film, but I didn't find them very memorable or catchy. There is a Sing Along With The Movie bonus feature as well as Disney's Song Selection, but with the unimpressive songs they hardly seem to matter. The Sing Along shows the songs' lyrics and they fill in as the song is sung, kinda like karaoke. The Song Selection just jumps to the songs in the movie. Another bonus feature is called Disney Intermission and occurs when the movie is paused, but it's basically just some simple games. And finally there's something called Enchanted Environment, which is a scene inside Pooh's house of a fire in the fireplace and a Christmas tree and snow falling outside the window. It's on a loop so nothing actually happens but it's a nice scene to have in the background if you're not actually watching TV. The Gift of Friendship Edition, as it's called, comes with a blu-ray disc, a DVD disc, and a digital copy. Plus, it contains a letters-to-santa kit. Fans of Pooh may like this release, but I thought it was just okay. The characters do say some funny things, but overall I tend to just find Pooh and his pals kinda boring.